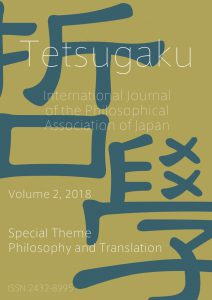 My article on Japanese-English philosophical translation is now out in Tetsugaku: International Journal of the Philosophical Association of Japan. Abstract: The influential and prolific philosopher and translator of philosophy James Heisig has argued for “desacralizing” translation into Japanese, and against “perfect translation” and for “thick translation” in Japanese to English translation. Heisig prioritizes broad appeal and readability over accuracy, bringing the translated philosopher into the reader’s space and facilitating an encounter on the latter’s terms rather than treating the author as a “sacred cow”. This article discusses Heisig’s programmatic statements on translation strategy in the context of the global dominance of English, the effects of declining language capabilities and unequal distribution of translation capabilities among Anglograph philosophers, the tendentially conservative and “domesticating” Anglospheric regime of translation, and the “foreignizing” alternatives found in Japanese translation history and in Schleiermacher, Nietzsche, Benjamin, and contemporary translation theorists. It suggests that learning from professional practices in the translation industry could help translating philosophers strike a suitable balance between domestication and foreignization. Click on the image above or follow this link to read the article on the journal’s website. Questions and comments on it are welcome via the contact form.